After you sign in or create a new account click PayPal button on this page again. Delivers in Business Days to for JUST $4.99! Delivers in 5 Business Days to for JUST $4.99! Dorm Co. Tip: Keep your coffee fresh and in a convenient container! Don't like coffee? You will! When you get to college, you'll find that coffee is a dorm essentials product that is as necessary as your Twin XL Dorm Bedding. And of course, you're going to need coffee to force yourself out of your super comfy dorm bedding. When you're in college, you may find yourself magically loving coffee if you haven't already. And if you love coffee, you're going to be needing a dorm coffee maker in your college dorm room. The wonderful smell of coffee in your college dorm room will help wake you up for your college classes, plus stopping at a coffee shop on campus every day is going to get quite expensive. That means coffee and a coffee maker are going to be some of the college supplies on the top of your college dorm checklist. The bag your coffee comes in can easily tip over and make a mess of ground coffee all over your dorm room. 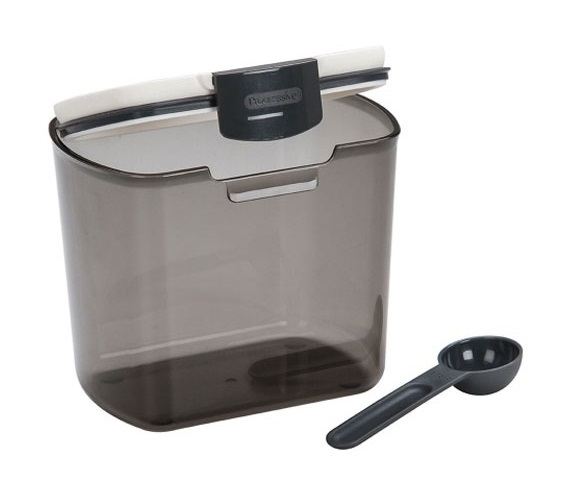 Keep your coffee from spilling and most importantly, keep it fresh in our Coffee Keeper. Our Coffee Keeper has UV blocking tinted sides so the flavor of your coffee doesn't get changed by the sun coming into your dorm room. This Coffee Keeper can also hold 1 pound of either whole bean or ground coffee so you don't have to worry about putting only half the bag of coffee in this dorm storage solution - you can keep the whole bag inside! There is a hinged lid on this college supplies product with an air-tight silicone seal so your coffee always stays as fresh as the day you opened the bag. Plus there is even a 1 Tablespoon scoop inside the container so you can accurately measure your coffee instead of just pouring the bag in your dorm necessity coffee maker and guessing how much to put in. Copyright © 2015 www.dormco.com. All Rights Reserved. Built with Volusion.